Were the victors of this great war the bloodthirsty and worldly Umayyad soldiers? Or, were the victors Imam Hussain and his companions who gave their lives along the path of love of the Truth and along the path of God? This question is answered by paying attention to the real meanings of victory and defeat. Victory does not mean that one leaves the battlefield untouched or that one’s enemy was killed. Victory means that man progressed along the path of his ultimate goal and did not allow his enemy to reach his goal. The final results of this bloody war become completely clear by paying attention to this meaning of the word. It is true that Hussain and his loyal companions tasted the drink of martyrdom after fighting like champions, but they reached their goals in an honorable way. The goal was to clarify what the quiddity of the Umayyads’ anti-Islamic movement was. The goal was to awaken the general Muslim body so that they become aware of the plans of these people who remained from the Age of Ignorance, who took pride in the customs of disbelief and idol-worship. These goals were clearly met. In the end, they cut down the trees of Umayyad oppression. They laid the groundwork to destroy the government that was stolen and that took pride in bringing customs of the Age of Ignorance, of corruption, of racism, and of oppression, back into the forefront. Yazid’s government showed its true face to everyone by killing righteous members of the Prophet’s family, especially Imam Hussain, who was a great Islamic leader. 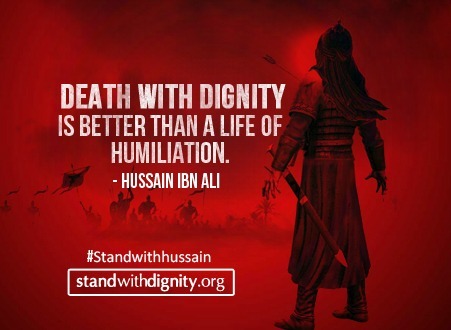 It is not strange that in all of the Islamic revolutions that occurred after the event of Karbala, ‘revenge for these martyrs’ and ‘the satisfaction of the Prophet’s progeny’ is seen. This occurred until the Abbasid dynasty who took benefit from this issue in its own government – then they took the path of oppression. What victory is greater than this where not only does one reach their goals, but they also become a role model for all free people of the world?